We are getting such a great response from our followers on our “Alliteration” link-ups that we have decided to keep doing them. If you have missed it, our first was featured here and was called “School, Sport, Smile”. The second was featured here and was called “Listen, Love, Learn”. As you notice, they all begin with the same letter and at least one word is school related. The link-ups are short and simple and no rules apply. We are wanting to make this a regular event. It is time for another “Alliteration Link-up”. MUSIC- What kind of MUSIC do you like to listen to? Do you have a favorite MUSIC group? MENU- When you go out, what is your favorite item to order from a MENU? MANAGEMENT- What is your best classroom MANAGEMENT tip? What works best for you? 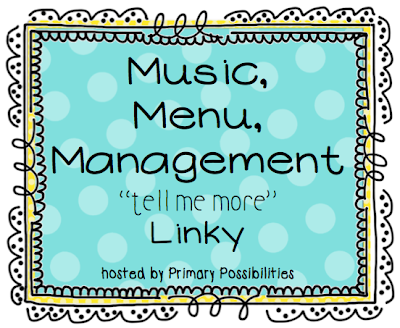 How do you MANAGE your literacy stations, math rotations, small groups, and organization tips? MUSIC- When I get in my truck, or when I am relaxing or even cooking, I like to listen to country MUSIC. I am a terrible singer! But, I love to bust out in a tune to country music. My favorite country artists are Gary Allen, Eric Church, and Brad Paisley. I love the rock and country in all of them. MENU- One of my favorite places to go is Cheeseburger in Paradise. I order the Sailor Salad or the Calypso Chicken Salad each time I go. Yum!! 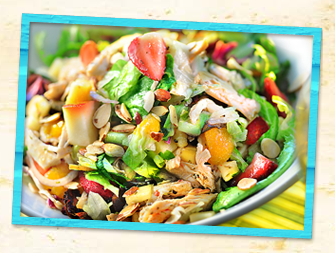 The fresh fruit and almonds in the Calypso Chicken Salad are FABULOUS!! 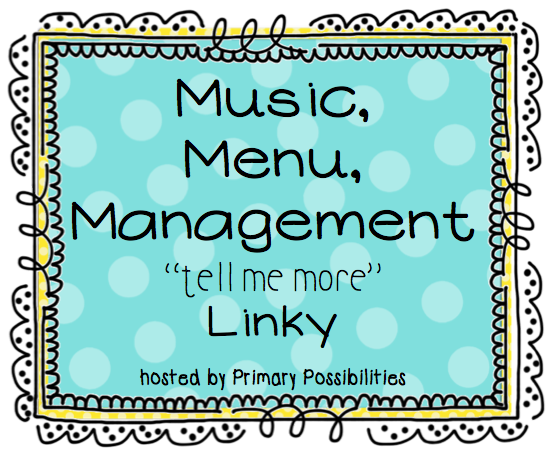 MANAGEMENT- There are so many phrases that I use in my kindergarten classroom. I always say a phrase and have my students either answer with a different phrase or echo what I had already said. I also use Whole Brain Teaching- 5 Classroom Rules. 2. Raise your hand for permission to speak. 3. Raise your hand for permission to leave your seat. 5. Keep your dear teacher happy. I recently updated my Attention Grabbers Behavior Management packet to include "index card size" printables too. I had several requests to make them smaller. I use them all the time. 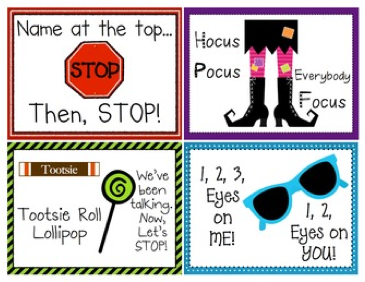 Classroom management in my classroom revolves around most of the sayings in this packet. I have shared many times in many posts how much these help minimize distraction, get students focused, and helps with control of the classroom. I also have a FREEBIE for all of you that are state testing right now. Click the picture below or here to link to the freebie. 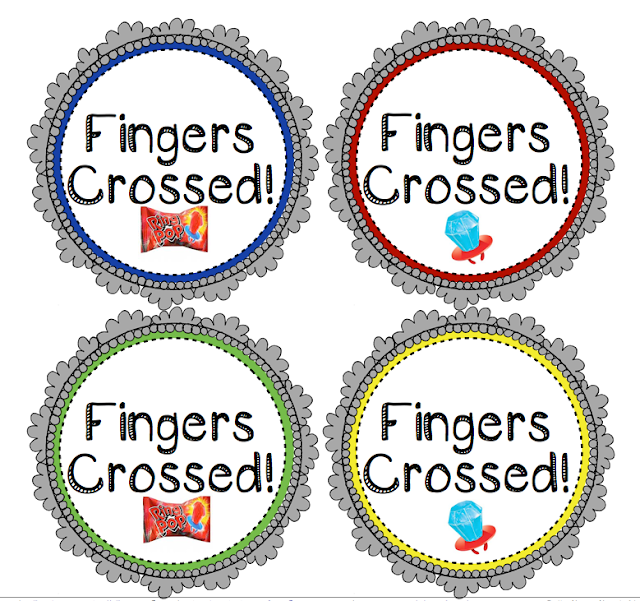 I am attaching these to Ring Pops for the 3rd, 4th, and 5th graders taking the ISTEP test in our school this week. Thank you for linking up and remember to check back regularly as we will be making this an on-going link-up. 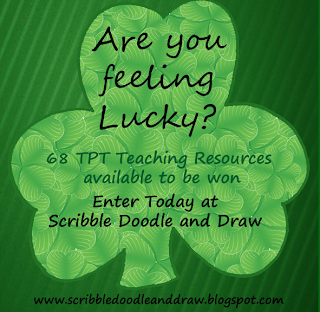 There is also a giveaway going on at Scribble Doodle and Draw. Be sure to hop on over and check it out. I've been following your blog for awhile now! I just recently started my own so this is my first link up with you! I, too, am a country girl! I just love to turn it up and sing along (isn't that a song??). I am also beginning to use a lot of the whole brain teaching techniques. My " go-to's" are hands in top, that means stop and hocus pocus, let's all focus! Thanks for the linky and I'm looking forward to more! These alliteration linkys sound so fun! I just linked up to this one! Can't wait for more! I also love country music. I have tickets to see Brad Paisley and Eric Church this summer! They are great! I just linked up as well and if you love country you have to listen to Hunter Hayes! I also love Brad Paisley. So happy to find this great linky party and I am your newest follower. A Glance at My Week & a Freebie!